Have you ever gone hunting for birds? Yes? No? If not, do try some day. It’s humbling. It defies all your knowledge and skills in hunting and forces you to reassess your strategies. See, birds are a different kind of prey to go for. First of all, they’re smaller than the mammals you prefer. That means that your level of accuracy has got to be on point. Miss the feathered creature and your chances of returning home with a kill are greatly diminished. Bird hunting entails patience. And it isn’t the kind of patience you employ when hunting, say, elk. This kind of patience requires you to wait for the very precise moment. Take your eye off the viewfinder for a second and you lose that moment. And it is only at this precise moment can you take your shot. Miss and it’s bye bye birdie. Bird hunting also entails a high level of cunning. You need to have all sorts of bird calls to lure the prey into your clutches. With all these skills required of you, the last thing you need is a backpack that won’t grant you the necessary support. That’s why Tenzing went to their drawing board, designed, crafted and created the TZTP14 pack. It’s a hunting backpack that’s made specifically for bird hunters. And they specify that it’s for those whose preference is turkey, the hardest bird to hunt. As you pore through this Tenzing TZ TP14 Turkey Pack review, you’ll find out why this is an ideal backpack for the turkey hunters. When a manufacturer decides that their pack needs a frame, what you know is that this pack will be used to carry massive loads. And with an aluminum frame, the Tenzing TZ TP14 Turkey Pack is bound to be a joy to carry, heavy or not. Perhaps you’re new to the hunting realm and are wondering what all the hype is about this aluminum frame. Well, the word aluminum spells strength. It spells total durability. It spells light weight. Having a frame, the weight of the pack is transferred from your shoulders as you carry it. You know how the strain if a load can collect on your shoulders, leaving you feeling sore at the end of a journey. Well, the frame evens out the load and transfers the heft to your hips. Why the hips, you ask? The hips are stronger and the weight transferred on to this part makes the back seem lighter that is making it easier for you to carry. It also gives you a more upright posture as you walk, enhancing your level of comfort. Using the word versatility on the Tenzing TZ TP14 Turkey Pack is an understatement. It’s more than versatile. Here’s why I think so. You see, at the start of your journey, the TP14 will take in all your gear in its ample space. It starts the expedition as a backpack. Carry it comfortably to the hunting spot and take it off your back. Then, pull out the spring loaded adjustable aluminum legs found on the side of the pack and this amazing backpack transforms into a hunting chair. That’s right! The TP14 is a transformer. The aluminum seat makes it stand upright, fold out the padded seat underneath and rest your back on the padded backrest. And because hunting turkey demands a great deal of patience, having a chair allows you to sit comfortably and wait patiently for the moment to strike. 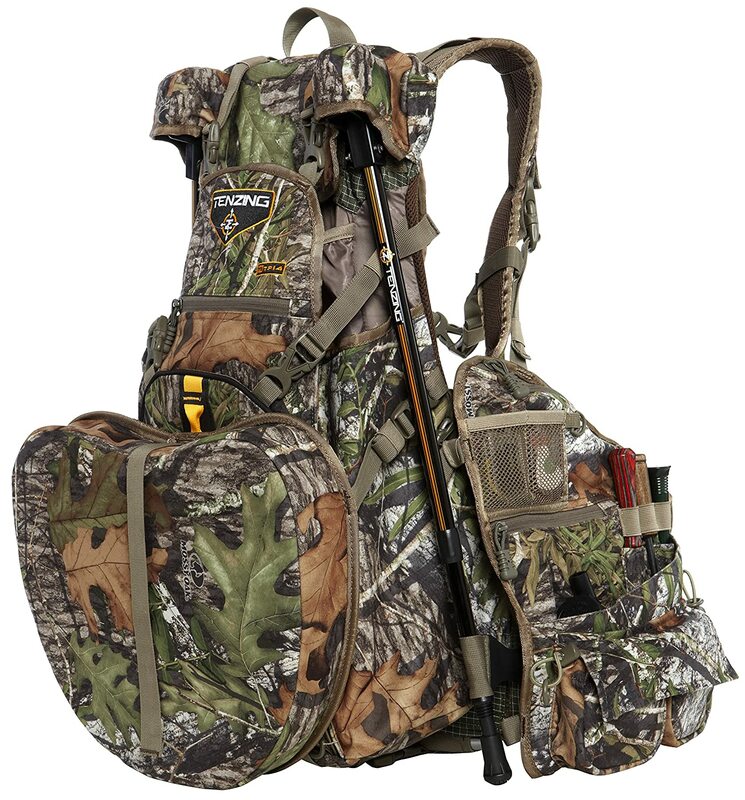 This hunting backpack was made to carry large sums of gear, just to make your turkey hunting experience more enjoyable. It has a main pack pocket which has dimensions of 24 inches by 14 inches by 8 inches. Then, there’s also a zippered back sleeve pocket which measures 14 inches by 8 inches by 1 inch. On the front right portion, there are two slate pockets, three striker sleeves, and 6 mesh pocket. On the front left, there are one box call pocket, seven shot shell loops, and one specialized diaphragm pockets. All these add up to a staggering 14 pockets and compartments in total. Put all the pockets and compartments together and this Tenzing backpack provides a whopping 4000 cubic inches of carrying capacity. Water is important in any expedition, isn’t it? And in a turkey hunting expedition, you’ll be seated on the ground for ages before you get the right shot. To keep you well hydrated throughout, whether you’re hiking to the hunting spot or seated silently, there’s a hydration compartment conveniently built into the TP14. In this compartment, you can fit in a reservoir of three liters. Is that enough? I think that’s more than enough water. Attach a compatible hydration bladder, and you don’t have to shift positioning to get your water. Simply grab hold of the bladder and get supplied with water. For added comfort, the Tenzing TZ TP14 Turkey Pack has been made with a back pad that has air channeled right through it to keep it and your back cool. There are two instances when you love having this. First, as you’re hiking, the backpack behind you embracing your back. You’re bound to feel the heat generated from the load, cause your back to sweat. With the channeled air-cooled back pad, air is allowed to flow freely between your back and the pack, keeping you feeling cool and fresh. The second instance is when you’re seated, your back resting on the back pad. This air cooling will enhance your comfort, allowing you to feel the cool air on your back as you’re rested on it. 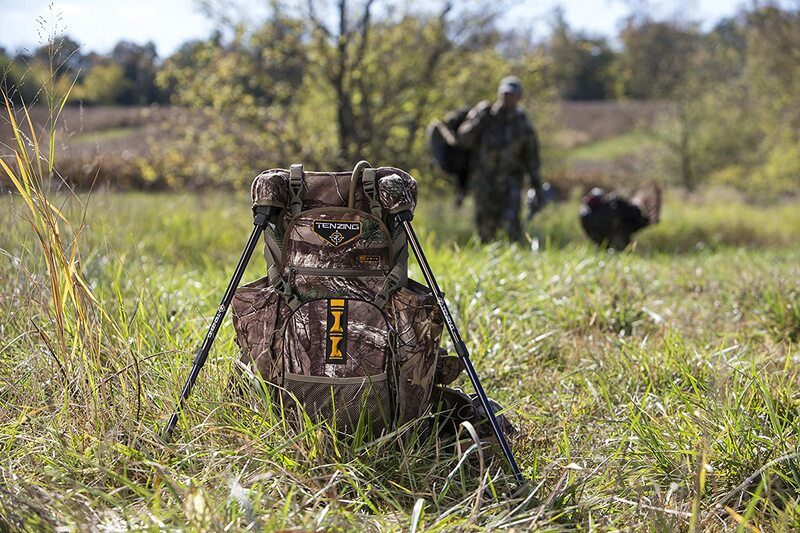 The Tenzing TZ TP14 Turkey Pack has an aluminum frame that eases carrying heavy loads. The pack’s adjustable aluminum legs and padded seat allow it to transform into a hunting chair. With a total of 14 pockets and compartments, the Tenzing TZ TP14 can carry a total of 4000 cubic inches of the load. It’s H20 compatible and can accommodate a reservoir of three liters. With a channeled air-cooled back pad, your back remains cool while carrying it. The pack isn’t water resistant. Despite the numerous pockets, they are small in size to fit a turkey. Q: How many color choices are there for this pack? A: You can get one called Obsession and another color option of Realtree Max Xtra. Q: Is this backpack ideal for large bodied people? A: It certainly is. The straps are adjustable. Q: Can a turkey fit in it? Q: Does it have a waist band strap? A: Yes, the pack comes with a waist band strap as well. Q: Dimensions of the seat? A: It measures 12 inches by 13.5 inches by 2.5 inches. The concept of the Tenzing TZ TP14 Turkey Pack is one that other manufacturers should begin to embrace. There’s nothing better than having a pack that not only carries your load but also acts like a hunting chair. Yes, the inability to carry the turkey within its depths is a downer but the advantages of the TP14 far outweigh its disadvantages. So, for all, you bird hunters out there, get yourself a Tenzing TZ TP14 Turkey Pack.